Lahore: Under the direction of the Chief Minister of the Punjab, Mian Muhammad Shahbaz Sharif; Punjab Skills Development Fund (PSDF) has taken concrete steps to create income generating opportunities for the unemployed youth of Punjab. PSDF and Uber signed a Memorandum of Understanding (MoU), and announced to work together towards enhancing economic opportunities in the transport sector of Punjab. 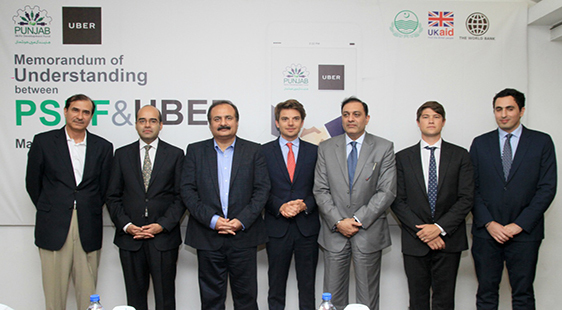 L-R: Mr. Faisal Fareed – Board Member, PSDF & Managing Director, Maxim International; Mr. Safee Shah – General Manager, Uber Pakistan; Mr. Rana Mashood Ahmad Khan – Minister for Education; Mr. Pierre Dimitri Gore-Coty – Head of Uber Operations Europe, Middle East and Africa; Mr. Jawad Khan – Chief Executive Officer, PSDF; Mr. Anthony Le Roux – General Manager Uber, Middle East & Africa; Mr. Ghassan Haddad – Head of Uber, Public Policy Middle East, Turkey and Pakistan. Through this collaboration, young job seekers as well as those generating low income will be provided with the necessary skills so that they can benefit from the opportunities that Uber offers in Pakistan. By running a mass mobilization campaign within Punjab, a trainee pool will be developed and trained in line with a curriculum approved by Uber. These trainings, supported by PSDF, will be designed to help candidates in developing their technical, operational and entrepreneurial expertise, as well as skills that are necessary to ensure the safety and security of Uber’s riders. Once trained, these candidates will then be introduced to and integrated with Uber’s technology system. Talks are also underway to engage the identified trainee pool for selected opportunities overseas. Along with this, both parties also intend to undertake a survey in Punjab to determine the role that new technologies in the shared economy can play in supporting large-scale economic opportunity generation in the transport sector. Punjab Skills Development Fund (PSDF) is a section 42 not-for-profit company established in 2010 under the Companies Ordinance 1984 by the Government of the Punjab in partnership with the UK’s Department for International Development (DFID, UK). The World Bank is also providing funds to the Punjab Government for the trainings to be funded by PSDF. PSDF aims to provide quality skills and vocational training opportunities to the poor and vulnerable populations of all the 36 districts of Punjab in order to improve livelihood prospects for them. Since its establishment in 2011, PSDF has trained 150,000 youth in over 200 trades and it works with over 250 private & public sector training providers. Over the next 5 years, we will be training over 400,000 youth across Punjab that will be employed in Pakistan and abroad. Uber’s mission is to help people get a ride at the push of a button – everywhere and for everyone. We started in 2009 to solve a simple problem – how do you get a ride at the touch of a button? Six years and over a billion trips later, we’ve started tackling an even greater challenge: reducing congestion and pollution in our cities by getting more people into fewer cars.